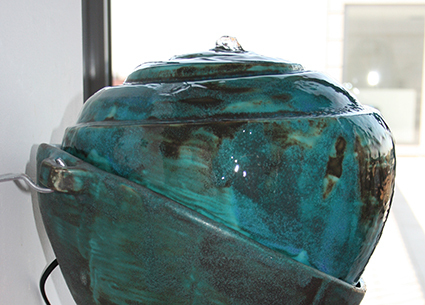 This stoneware fountain is a beautiful object at itself but it also fits into my new collection of handthrown urns. Inside the fountain can be a small container for a certain amount of ash. An urn as a fountain has a beautiful symbolism and is at the same time a nice object to decorate the home. A fountain is also good for the atmospheric humidity and the sound of the running water is nice and calming.